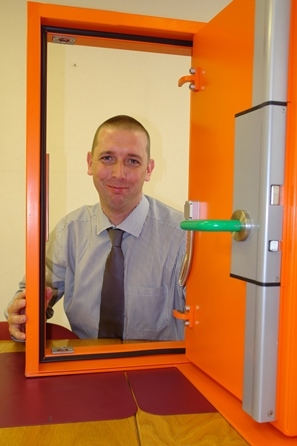 Philip Prigg has been appointed new Product Sales Manager, responsible for High Security Locking, by Pickersgill-Kaye to oversee the Leeds lock manufacturer’s continuing expansion into both home and overseas markets. Mr Prigg has worked for ASSA ABLOY, the global leader in door opening solutions and Pickersgill-Kaye’s parent company, for over eight years in areas of manufacturing, installation and product sales. During that time he became very familiar with the company’s renowned high security multipoint locks and the heavy duty perimeter gate lock range. He said: “I’m thrilled to be working for Pickersgill-Kaye and promoting their products – I’ve always had a great relationship with them. I think that they make the most superior high security locks for many sectors, including protecting critical national infrastructure sites, the Government and Ministry of Defence. Recognised as one of the UK’s leaders in design engineering and manufacture for custodial and high security locking solutions, Pickersgill-Kaye, through its growing product range, is able to offer a complete commercial package for new build and refurbishment projects across the UK and overseas. Available in both surface mounted and mortice versions, Pickersgill-Kaye’s portfolio of multi and single point locks are manufactured entirely in the UK to the highest technical standards and aesthetically designed to complement the modern workplace. The range of locks, bolts and fittings has been specifically developed to meet exacting standards of physical attack but maintain safe and easy exit. The products are manufactured to the highest specifications and tested to European BS EN standards for panic and emergency exit as well as undergoing independent blast testing, cycle testing in excess of 1 million cycles and being fire tested, to BS EN standards, as part of a secure doorset. Its locks are designed on state-of-the-art CAD software and are subjected to extensive and challenging testing on key operation, lock construction and overall durability and resistance to attack, in order to satisfy the operational requirements of national and international market sectors. Approvals include certification to LPS 1175 Issue 7 Levels SR3 and SR4 and government standards.